Since I’m a total birth junkie, I can’t let any moment with obsess-about-birth potential go by without properly obsessing. 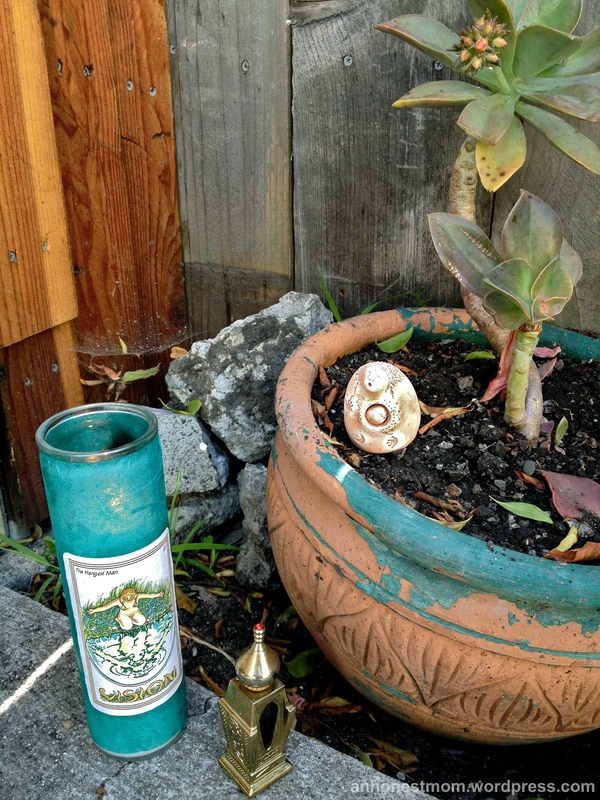 So I made this little altar in the corner of our back patio where I meditated for 3 interrupted minutes on birthing Cal. I’m diving in today because it was almost exactly a year ago to the minute that Cal was born. Even as I write them, the words “Cal was born” are a passive and withered description of what actually happened. No single human in the history of the world “was born.” Someone birthed them while they simultaneously birthed themselves. In reality, Cal and I and pitocin and AJ and my midwife and doula and nurses did a magical, timeless birthing together. Cal navigated out of the most cramped but yielding passage. I faced all of my yeses and my nos and a deep, dark, holy abyss. I stood on the very pin prick point where the breathless height of awe tips over into terror. Right now a year ago I was puking. Yep. 12:15. Puke time. After I got Cal down for his nap this afternoon, I positively skipped down the stairs to my laptop where I flicked through all our Cal birth photos. I gushed over little snippets of video too. I forgot how lucid I was between contractions. And how quiet I was in the beginning. How loud at the end. Now I’m feeling high. Just the thoughts and scenes and sounds of our birthing a year ago have left my body feeling like a slightly jostled bottle of sparkling water. I’m actually fizzing. Birth is unequivocaly the peak experience of my life. Both of my births. Celebrating Jo’s and now Cal’s birth feels so much deeper and more real than celebrating my own. And it’s not because of my unending love for each of them. It’s because I remember being there. Because I had no choice but to go straight into the depths of my body with each of them. And the only way out was straight through the pain and intensity and I-can’t-do-this of it all. There has never been anything like it for me. I’ve been skirting around the edges of my grief about the decision that AJ and I have made to stop making babies. I’m firmly rooted in our choice–I do not want to raise any more children. About that I am crystal clear. Oh, but birth. I would do you again in a heartbeat. Even after having just listened to this. Nay, BECAUSE I just listened to that. There will never be another thing in my life that will take me to that place. The small, smooth stone of that truth drops down and leaves an ache. There is an emptiness. I’m on the other end of my births, and I can never go back again. It is this minute. This very minute a year ago that I felt that shockingly insanely huge hard round head coming out. Between contractions, it just lodged there, expanding me, and there was nothing but that smooth, molded skull and my voice and the vast shock of awe. Photo by Best Doula on Earth, Candace Palmerlee. If you’d like to read more about Cal’s birth, help yourself to Part 1 and Part 2. And here’s my sappy nod to Jo’s. Wonderfully written! It’s so awesome you are chronicling all this. Totally realize a year later you don’t forget births but the other stuff right after…sleep deprivation does make things fuzzy.